What, exactly, makes a dragon? Other magical, reptilian beasts have great power. A few creatures, such as drakes and wyverns, share certain characteristics with dragons. What sets dragons apart from them? All true dragons have distinct age categories and grow in power and strength as they progress through those categories. Every dragon has both a breath weapon and an array of supernatural abilities, including an aura that induces overwhelming fear. All dragons also have the same basic body structure. Covered in scales, possessed of four legs and a long, writhing tail, a dragon appears to be a giant reptile at first glance. Nevertheless, dragons are a classification unto themselves, with characteristics of predatory mammals as well as reptiles. In fact, a dragon&apos;s external anatomy—with four legs directly beneath the body rather than splayed to the sides—is more mammalian than reptilian. At the center of a dragon&apos;s eye is a thin, vertical pupil, like that of a cat. Whereas a cat&apos;s pupil expands to admit more light in dark areas, however, the expansion of a dragon&apos;s pupil allows primal energy flowing in the creature&apos;s bloodstream to emanate from the pupil (see Internal Anatomy). This minute seepage of magic grants a dragon its darkvision. Dragons do not have external ears. As with snakes, an internal mechanism detects sounds. From the outside, the only evidence of this mechanism is a tiny hole between the scales. Some dragons have frills or fringes of scales along their heads; in such cases, one such set of scales might surround the auditory canal, focusing sound inward in a manner similar to that of a mammal&apos;s external ear. These scales are not, however, a necessary part of the design. Due to their scales and thick hides, dragons have a poor tactile sense. Hence, a dragon can be comfortable sleeping on a jagged pile of treasure, as long as the pile vaguely conforms to the dragon&apos;s shape. Dragons are, however, sensitive to pain. Anything capable of penetrating their hide and scales receives their full attention. A dragon&apos;s sense of smell is split between its nostrils and its tongue. The nasal aperture can detect odors from a great distance, but that aperture is less capable than the tongue of differentiating an odor&apos;s components. When a dragon draws near the source of an interesting scent, its flickering tongue identifies and pinpoints various odors, much as a snake&apos;s tongue does. The tongue is also a dragon&apos;s organ of taste. Dragons can detect nuances of flavor better than humanoids can. For example, a dragon could describe every ingredient of a stew after ingesting a single large mouthful. As with a crocodile, the muscles that close a dragon&apos;s jaw are more powerful than the ones that open it—yet only the mightiest foe could hope to hold a dragon&apos;s jaw shut if a dragon wants to open it. The teeth, also resembling those of a crocodile, include fangs for tearing and puncturing, incisors for severing flesh from bone, and a series of molars for gripping and grinding. The jaw can also unhinge, stretching a dragon&apos;s maw to massive proportions similar to the way a snake&apos;s jaws unhinge. Dragons rarely display this ability, because they use it only to bite larger foes or to swallow prey too tough to be torn into smaller bits. The throat can stretch wide enough to accommodate anything the unhinged jaws can encompass, though swallowing something so large that a dragon must unhinge its jaw is a painful experience. A dragon&apos;s teeth and fangs consist of a hard substance more closely related to the substance of a dragon&apos;s bones (see Skeletal System) than to the enamel and dentin that comprise the teeth of most creatures. Similarly, the interior of the tooth resembles marrow more than it does pulp. A dragon grows a new set of teeth each time it increases in size. Between these periods, if a dragon loses a tooth, it has to do without unless it has a means of healing magically. All dragons have some combination of protrusions in the form of spines, claws, horns, or all three. These protrusions are made of a substance similar to that of dragons&apos; teeth. They are not keratinous, as are the horns of most horned animals, nor have they the same composition as dragon bones, though they&apos;re close. Spines are anchored in muscle, connected to the skeleton by a series of ligaments. Claws and horns connect directly to the skeleton. Horns and spines grow as a dragon grows. Its claws, like its teeth, fall out and regrow when a dragon increases its size. A dragon&apos;s feet have both reptilian and avian characteristics. A foot normally has three forwardfacing claws plus a single claw near the rear of the foot, though a significant minority of dragons has four forward-facing claws. The rear claw normally faces backward when a dragon is walking or running, but it can twist forward to serve as something akin to an opposable thumb. Although the rear claw is not fully prehensile or as dexterous as a human hand, it does allow a dragon to grip objects and even to use tools or writing styluses if they&apos;re properly sized and designed for draconic use. The texture of a dragon&apos;s hide depends, in part, on a dragon&apos;s variety. For instance, a typical black dragon&apos;s outer layer of scales feels rough and leathery, like that of an alligator, whereas a green dragon&apos;s scales generally feel smoother, like hardened snakeskin. These tendencies are not absolute. For example, the hides of black dragons from different bloodlines might have markedly different textures. In any case, individual scales are more or less the same. The way they fit together determines the skin&apos;s texture. Larger scales, such as those that cover the head, neck, and back, connect to the skin at one end and overlap neighboring scales at the other. This arrangement creates a layer that resembles scale armor or shingles on a roof. Smaller scales, such as those that cover a dragon&apos;s underside, rest side by side rather than overlapping. Dragon scales are slightly more flexible than steel and substantially stronger, making them perfect armor. Unfortunately for those who desire to make armor from dragon scales, harvesting scales is difficult, and armor constructed from such scales lasts only a few weeks after it is taken from a living dragon. Everyone knows stories of unique sets of magic armor made of dragon scales, but it might be impossible to construct a mundane armor from harvested scales without a long-lost creation ritual. A dragon never sheds its skin, since its scales grow slowly throughout the course of its life. It occasionally loses individual scales through injury or illness or as a result of natural molting. These patches remain bare for a few months at most, before replacement scales grow large enough to fill the gap. A dragon&apos;s wings are simple in structure. Each consists of a membrane of thin hide stretched across a structure of lightweight bones, like a bat&apos;s wing. Each wing is large enough that nothing short of numerous large tears can threaten a membrane&apos;s integrity. As a result, it&apos;s difficult to injure a dragon so severely that it cannot fly. Such tears heal relatively quickly. Many details that differentiate dragons from other creatures are internal. Although a dragon&apos;s scales and flesh somewhat resemble those of reptiles, a different story unfolds underneath. In the following sections, numbers in parentheses refer to the indicated locations on the accompanying illustrations. Added by RemaaiBrain (1): A dragon&apos;s brain is large both in absolute terms and as a proportion of body mass. A significant part of the brain is dedicated to memory and reasoning, and other parts control two functions unique to dragons: the mystical power of the eyes and the channeling of learned behaviors into the instinctive, "reptilian" brain. Directly above the sensory centers of the cerebral cortex, a dragon has an extra growth—a miniature lobe—that has a direct synaptic connection to the optic nerves. Sages believe that this growth generates a dragon&apos;s frightful presence. Although not a true gaze attack, the effect emanates from the eyes, which might be why the legend arose that dragons have a hypnotic gaze. This miniature lobe draws mystical power from blood that flows through the brain. After a dragon expends that power, it must concentrate for a few moments to reinvigorate the lobe and thus ready the ability for another use. The second major factor that sets a dragon&apos;s brain apart from those of other creatures is the connection of the learning and memory portions of the brain with the so-called reptilian brain, which is responsible for rage, the fight-or-flight mechanism, and other instinctive behaviors. Thick clusters of synapses form this connection, incorporating anything a dragon learns into its instinctive behavior. Learned techniques such as effective combat and hunting tactics become an innate part of the wyrm&apos;s automatic responses. Knowledge even passes to offspring. Young dragons inherit all their parents&apos; instincts and reactive behavior, including those traits that the parents have developed from their own memories and experiences. Larynx and Trachea (2 and 3): The larynx contains an array of vocal cords slightly more complex than a human&apos;s. Although most dragons prefer to speak in a narrow range of tones, a dragon can produce any sound from a dull rumble to a shriek so high-pitched that human ears can scarcely detect it. The trachea, as in most creatures, is the passage for a dragon&apos;s respiration. Lungs (4): The lungs take up an enormous portion of a dragon&apos;s chest cavity, given that they must oxygenate the blood for such a massive creature. They more closely resemble avian lungs than those of reptiles or mammals. They extract oxygen on both inhalation and exhalation. Heart (5): A dragon&apos;s heart is the source of its dragon&apos;s power. This huge, four-chambered organ pumps strongly enough to send blood flowing throughout the enormous beast. Legend has it that if a dragon&apos;s heart could be filled with granite, the strength of the heart&apos;s constriction would crush the stone to powder. The heart also generates the elemental energy that grants dragons their breath weapons and other powers. It is a dragon&apos;s most magical aspect. Without the mystical energy distributed by their hearts, dragons might be merely intelligent lizards. This energy suffuses the entire body through the blood. For parts of the body that require more focused power, the fundamentum (see below) is a more direct conduit. A dragon&apos;s blood is somewhat thinner than human blood and is darker, appearing black in dim lighting. The blood&apos;s temperature depends on the variety of dragon. Red dragon blood gives off steam, white dragon blood is barely above freezing, and so forth. Fundamentum (6): The fundamentum is an organ unique to dragons. Once thought to be the source of a dragon&apos;s breath weapon, the fundamentum is an enormous blood vessel, like an extremely large, complex artery. The fundamentum channels the energy-rich blood from the heart directly into the upper stomach of a dragon&apos;s gizzard. When examined outside a dragon, the fundamentum looks something like a rubbery hose, with a muscular outer layer capable of pumping blood similar to the way the heart does. This outer layer allows the fundamentum to constrict and open rapidly from one end to the other, propelling a wash of blood into the upper stomach. Gizzard (7): The gizzard of a dragon contains two hollows: a smaller "upper stomach" and the gizzard chamber. Elemental energy, transferred from the heart through the fundamentum, remains in the upper stomach until needed. This energy either aids in digestion—in which case it flows into the gizzard whenever food arrives from the esophagus—or it comprises a dragon&apos;s breath weapon. In truth, "breath weapon" is a misnomer, since the fire, poison, acid, or other substance discharges not from the lungs but from the upper stomach. The stream of energy is more accurately vomited than exhaled. Traces of this energy might leak from a dragon&apos;s upper stomach into the esophagus, mouth, and nostrils, from which they might emerge as puffs of smoke or wisps of poison—another reason people believe the breath weapon is part of the respiratory system. This leaking energy also causes the damage dealt by most dragons&apos; bite attacks. After food reaches the gizzard, the hard plates inside the organ, similar in composition to the horns and teeth, grind it up. The upper stomach bathes the swallowed food in energy from its pool. Added by RemaaiThe musculature of a dragon somewhat resembles that of a great hunting cat from neck to rump and that of a constrictor serpent along the neck and tail. The area that defies comparison is the area at the wing-base and along the chest. 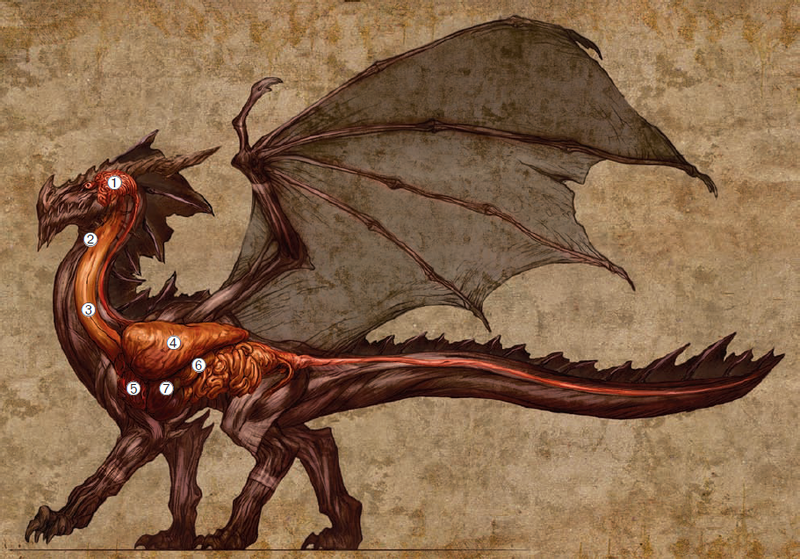 Wing and chest muscles are dense and larger than any other muscle group in the wyrm&apos;s anatomy. Despite their great power, however, they could not provide lift to such a massive beast without magical assistance. Sages postulate that the elemental energy coursing through a dragon&apos;s cardiovascular system contributes to the beast&apos;s ability to fly. According to this theory, magic in the wings grants a dragon strength beyond that provided by the muscles. The alar pectoral (1) is the main flight muscle, used on the wing&apos;s downstroke. The alar latissimus dorsi (2) draws the wing up and back, and the alar deltoid (3) and alar cleidomastoid (4) draw them up and forward. The muscles of the wings themselves serve primarily to control the wings&apos; shape, aiding a dragon&apos;s aerial maneuverability. The alar tricep (5) and alar bicep (6) fold and unfold the wings, and the alar carpi ulnaris (7) and alar carpi radialus (8) allow the wings to wrap and twist. In addition to being the strongest muscle group in a dragon&apos;s body, the pectoral muscles are also the most enduring. Enormous quantities of blood flow in and out of the muscles regularly, sweeping away—or even destroying, thanks to the blood&apos;s innate energy— toxins that cause fatigue. A dragon can fly for many minutes at full speed, for hours at a reasonable pace, and for days on end if it relies substantially on gliding and updrafts. Dragons maintain their average overland flight speeds by switching back and forth between true flight and periods of gliding. Diagram illustrating draconic skeletal structure. 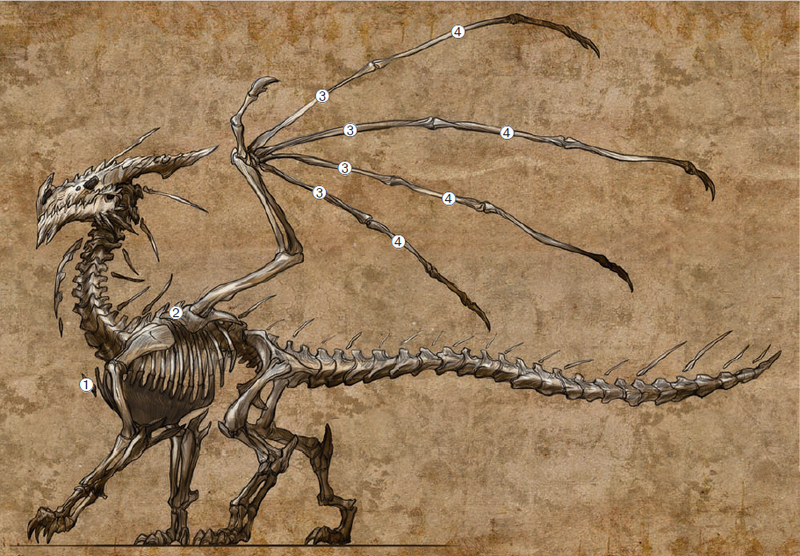 Added by RemaaiA dragon&apos;s skeletal system consists of more than five hundred separate bones. As with the muscular system, the skeleton between a dragon&apos;s neck and rump—the bones of its legs and torso—somewhat resembles the skeleton of a great feline, although the neck and tail bones more closely resemble those of serpents. The bones in and around the wings, like the muscles thereof, defy comparison. Dragon bone is strong. In fact, it is stronger than any known nonmagical material other than adamantine, in terms of the amount of pressure it can withstand. As with scales, when bone is removed from a dragon&apos;s body, it becomes relatively brittle. If a person were to consider dragon bone as a building material, good-quality stone or heavy wood would ultimately make better choices because of their comparable durability and wider availability. Dragon bones are hollow like those of birds, making them remarkably light for their size and strength. The marrow within is yet another repository of the elemental energy that flows through the bloodstream. The sternum (1) serves as an anchor for a dragon&apos;s flight muscles, and the scapula draconis (2) supports the wing. The metacarpis draconis (3) and alar phalanges (4) in each wing support the wing&apos;s flight surface. People assume that dragons are cold-blooded due to their apparently reptilian nature. In truth, a dragon does not depend upon the environment for warmth, but rather maintains a consistent internal temperature. By broad definition, that makes dragons warm-blooded, but true warm-blooded creatures maintain their body temperature by increasing their metabolic rate when the environment grows cold and by slowing their metabolism and shedding heat— through sweating, panting, or similar methods—when the environment warms. The elemental energy flowing through a dragon&apos;s bloodstream, on the other hand, maintains the wyrm&apos;s proper range of internal temperatures, regardless of external environment. Even dragons whose breath weapons have no intrinsic temperature requirements—such as breath weapons of poison or acid—use that energy to maintain internal heat. Naturally, dragons that have fire- or heat-based attacks maintain the highest body temperatures, and those that use cold or necrotic energy maintain low body temperatures. A dragon can enter a long sleep similar to a state of hibernation. Such a sleep allows the creature to pass decades or even centuries without waking. Dragons might enter this sleep as a way of surviving periods of famine without having to find a new lair, grieving the loss of a loved one, or withdrawing from the world out of sheer ennui. Because dragons make use of supernatural energy as part of their digestive process, they can consume and digest all sorts of food. They can also consume substances that wouldn&apos;t qualify as food to other living creatures. Dragons are predators—instinctive hunters at the top of the food chain. They find meat and other organic material the easiest fare to digest. When meat is unavailable, dragons resort to eating large plants, such as trees and large bushes. In emergencies, when the alternative is starvation, dragons might eat anything they can swallow: dead wood, rock, and other inorganic materials. Dragons find these substances distasteful. Furthermore, since rock, for instance, holds little nutritional value, a dragon must eat a lot more of such a substance than it needs of organic material—at least as much as its own body weight per day to maintain health. Dragons consider such measures humiliating, to the extent that some dragons, particularly reds, prefer to starve for a time rather than depend on food they weren&apos;t meant to eat. The elemental aspect of a dragon&apos;s digestive system, in addition to allowing the creature to eat substances others cannot, also makes it hyperefficient at digesting meats and other normal foods. Although a dragon can consume more than half its body weight in such food over the course of a day—and many do just that, with sufficient prey—a dragon needs to eat only about 15 to 20 percent of its body weight in organic food on a daily basis. At the other end of the scale, a dragon must eat an obscene amount of food to gain weight. Reports of the black dragon "Queen" Gugol, one of the few truly obese dragons known to modern-day sages and adventurers, say she eats more than twice her own body weight per day. Dragons might make use of their breath weapons even when hunting prey that could not possibly survive a melee encounter. Some dragons breathe on prey that is already dead. Since dragons use the same energy in digestion that they use for their breath weapons, they find it easier to digest prey that they have already bathed in their particular form of energy. A red dragon, for instance, can more swiftly digest—and thus prefers the taste of—prey that has been charred by fire. White dragons find it easier to digest prey when it is frozen solid, purple dragons have an easier time with prey that has begun to decay, and so forth. On rare occasions, a dragon might consume magic items rather than add them to its hoard. The creature&apos;s supernatural digestive system processes magic items more easily than nonmagical objects; a dragon gains as much nutrition from magic items as it does from meat. Only if a dragon were starving to the point of death, though, would it eat a magic item purely to sate its hunger. A dragon might eat a magic item for other reasons. When a dragon anticipates going into battle, it might consume a magic item in preparation, because the dragon could make use of the bonuses and abilities of the item for approximately 24 hours after eating it. For instance, a dragon that consumes a magic weapon gains that weapon&apos;s enhancement bonuses to its melee attacks and can use any of the weapon&apos;s powers according to the rules for that weapon, or a dragon that consumes a ring of invisibility can turn invisible, following the rules of the ring. A dragon can use only the powers of one item it consumes at a time, no matter how many it eats. The item remains intact in the dragon&apos;s gullet; cutting it free is a standard action after the dragon is slain. Dragons use this ability only rarely because magic items are more valuable in the hoard than in the gullet. When danger threatens, though, a dragon might resort to eating a magic item—particularly if the dragon has a number of items that it cannot use, such as magic weapons. alar , 解剖是指 "腋下的部位" , 但是作者似乎直接把 "翼狀的" 物體直接比喻成 "跟翅膀有關的部位"
那我就把前頭有使用 "alar" 形容的部位 , 將 "龍翼" 有關的部位 , 與 "前肢" 不同 , 引此做為區隔.